April 1st basically is the BANANO Republic national holiday. Our our Main-Net started exactly one year ago, on April 1, 2018. This means today is BANANO’s very first birthday, and of course we have some exciting news to properly celebrate this! developments below. 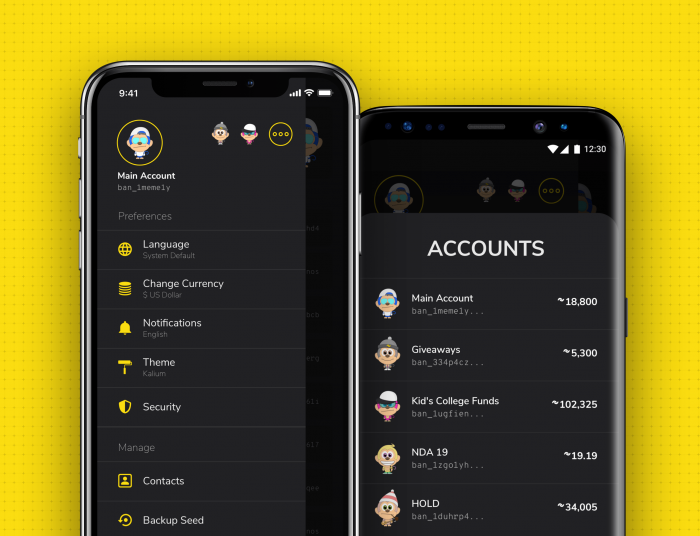 The first one is that Kalium — BANANO’s mobile wallet — got a major upgrade. The second one is a new BANANO application — Monkeytalks! Read more below, you’re gonna like this! April 1st — One year of BANANO Main Net! So much has happened in the last 12 months, and so much exciting stuff is happening these days as well! If you like to look back and learn what has happened during our first year, you will find all news from day one of BANANO summarized here at http://news.banano.how. 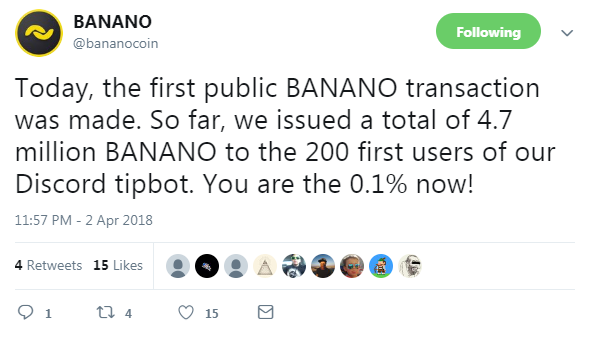 You’ll see that BANANO has been constantly developing its network, its wallets, its community and also its applications! Especially today, you might rather want to look forward and learn more about some new developments. It’s actually two new great things, both brought to you by our application development dreamteam Yekta and bbedward! And the first one is a new Kalium Release! It’s official now! 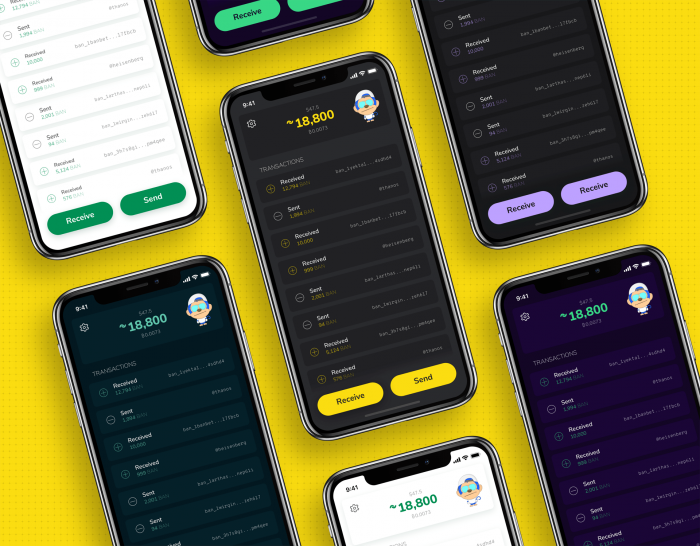 Kalium — BANANO’s mobile wallet — is going out of beta! The full release for both Android and iOS is available now in app stores, and Kalium is now built completely on Flutter, meaning it’ll always be the same for both platforms from now on (more historic context here). New Feature 1: Multi-account support! Up to now you only could have one address (the first address of the seed) in your Kalium wallet. Now you can access all of them, easily! 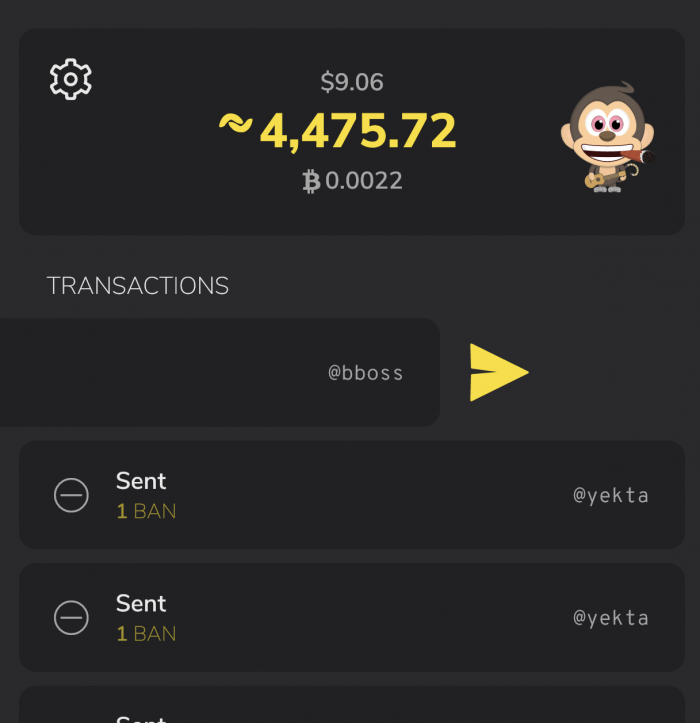 New Feature 2: ‘Swipe left to refund/send back’ function — Just swipe any transaction to the left to send the same amount of BANANO back to the sender. This feature can be quite helpful in situations like this: Let’s assume a friend accidentally sends 888 BANANO to your address and wants you to return them. Luckily, this new feature makes this very easy, simply swipe left and send it back. Being honest and doing friends a favor will always be rewarded. New Feature 3: Kalium now supports MonkeyTalks! 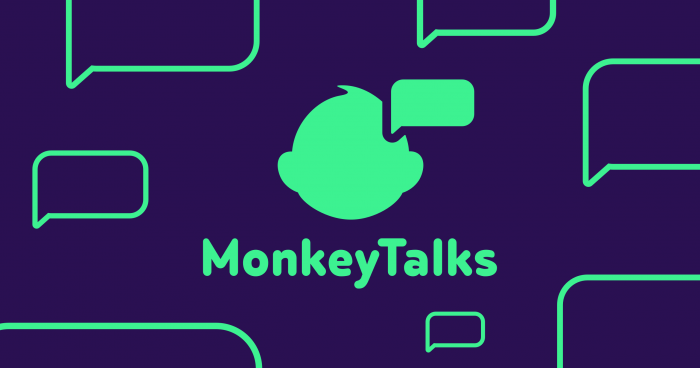 So what is MonkeyTalks? 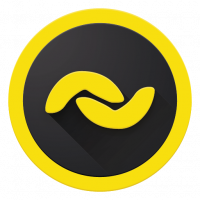 In brief, it’s a proof-of-concept application showing how versatile BANANO can be, and how easy it can be used in new contexts. 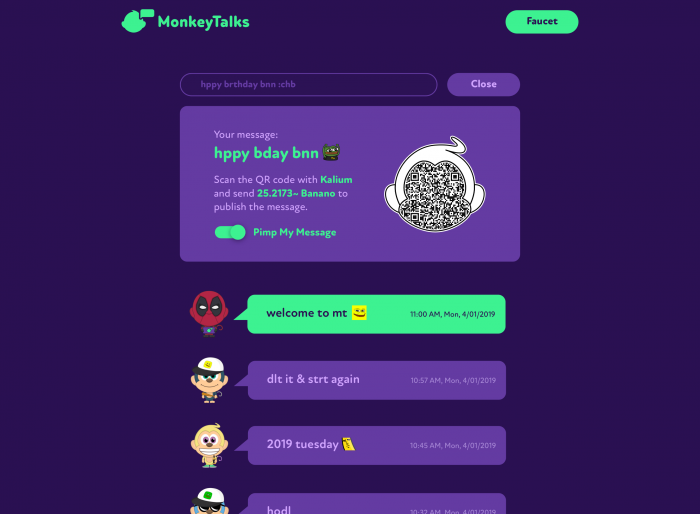 MonkeyTalks is a combination of a BANANO faucet and an on-chain messaging platform. For sending a message you’ll need to pay a small fee in BANANO, which in turn refills the faucet. To claim the faucet, click the button on the top of the page and paste your BANANO address. It’s claimable every 24 hours and gives you 0.01 % of the faucet balance (might be adjusted in the future). 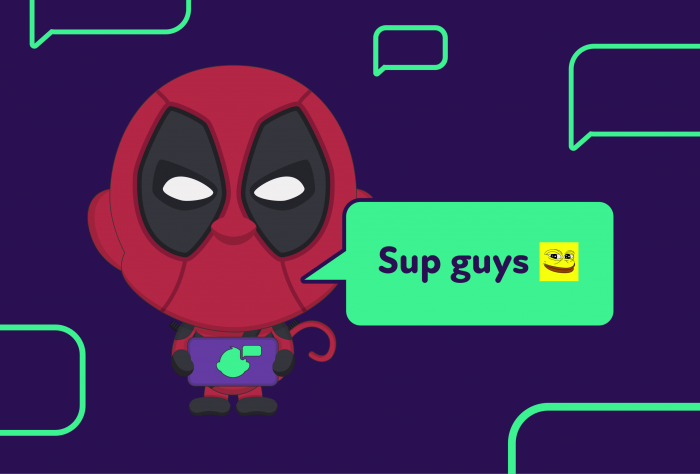 Then, you can use the messaging part to send messages, advertise your website, or just chat with others for fun. Make sure you have the latest release of Kalium, otherwise MonkeyTalks won’t work (Version 2.0.1 or higher on Android, Version 2.0.0 or higher on iOS). We are using the decimal places to encode the on-chain messages, similar to Nanote. To send a message, simply type it in the message field. To publish your message, just send the requested BANANO by scanning the QR code with your updated Kalium version. 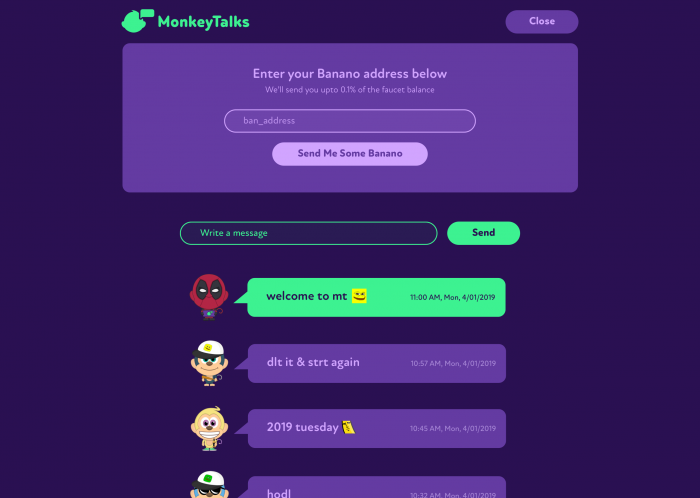 We see MonkeyTalks as a proof-of-concept website that combines a faucet giving out free BANANO with an actual application BANANO can be used for. The mastermind dev dreamteam (yekta & bbedward) behind all this can now also be found through their own app brand, Appditto!